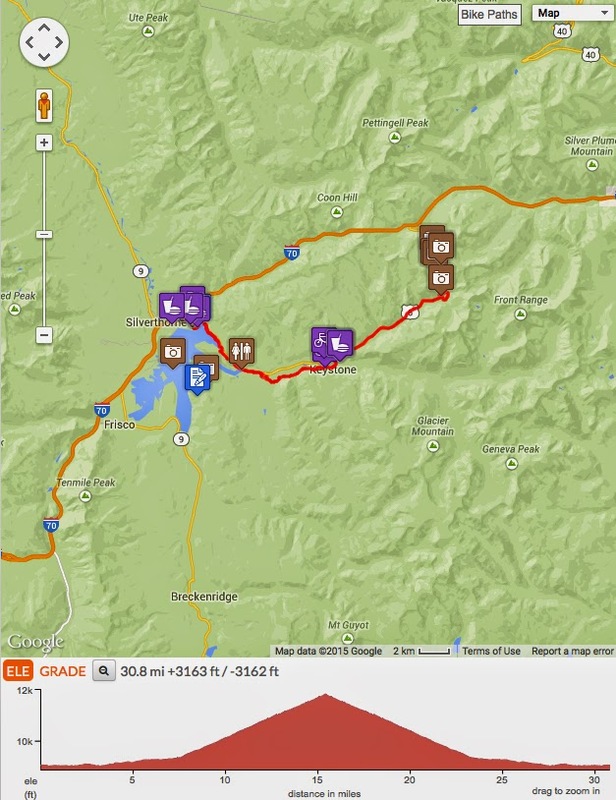 A cycling travel guide for cyclists interested in road bike riding in Summit County, Colorado. Below you will find helpful tips for planning your rides. I am honored to be an Ambassador for Ride with GPS. As a lover of good maps, traveling tips and excellent ride routes, Ride with GPS motivates me to share what I love most about cycling in Colorado while encouraging me to venture to new places through the recommendations of other RIDE Ambassadors. I am confident we will all benefit through local knowledge in finding excellent bike routes through this new Ambassador Program. I have lived in Colorado for 24 years. I have enjoyed most outdoor sports in the magnificent landscape of Colorado including skiing, mountaineering, rock climbing, mountain biking and kayaking. But it was on the road bike that I discovered the serenity of the views from the saddle combined with the intense effort of a long mountain pass. I am a fan of big mountain scenery. I chose to be a RIDE Ambassador to Summit County, not only because I lived in the area for a brief two years and much of my playtime has centered in Summit County over the years but because I believe no other place in Colorado offers such a variety of rides for cyclists. Whether you are an expert, a beginner, or on vacation with your family - you will find a ride that will make your weekend or holiday more enjoyable. Summit County is the land of mountain peaks, flowing water, fun outdoor events, breweries, cafes, small shops and plenty of active people. What better place to spend time? When I am not out on my bike using my Ride with GPS app, you can find me at my cycling blog Pedal Dancer® [www.PedalDancer.com], where I write, map and photograph cycling in Colorado, California, and France with the occasional side trip to Belgium, Italy, or Ireland. I have created a more detailed guide to the best climbs in Colorado on my bike blog at Pedal Dancer® Guide Page to COLORADO CLIMBS. Or visit my Guide Page to COLORADO CYCLING. I have chosen to highlight 6 rides for you. Within the description of each route, I mention route options and local tips and recommendations. I suspect you love maps as much as I do; I know you will love riding in Colorado as much as I do. Enjoy! 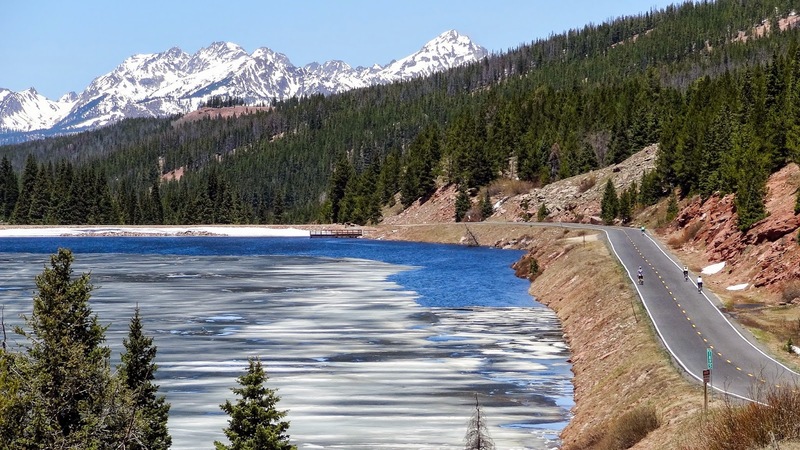 Although two routes begin from Frisco Marina, one from Dillon Marina, one from Breckenridge, one from Copper Mountain and one from Keystone - you may begin any of these rides from the towns within Summit County. 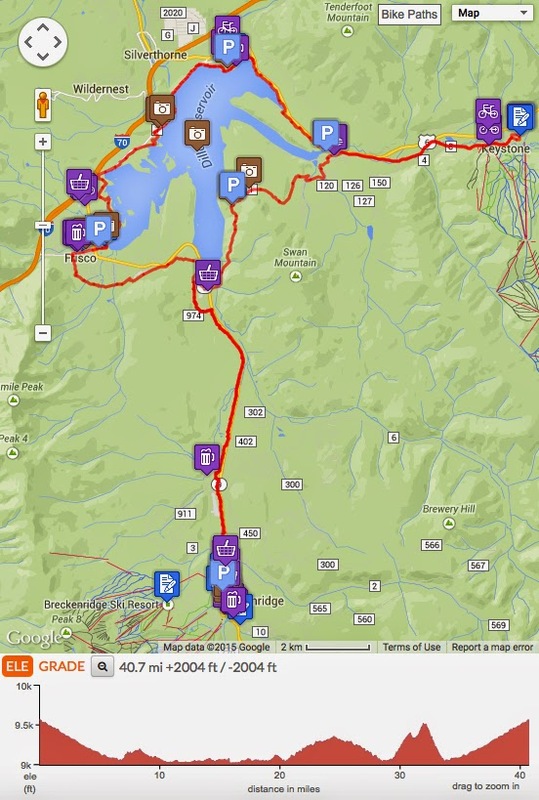 Copy these routes to your own Ride with GPS account and make custom changes. 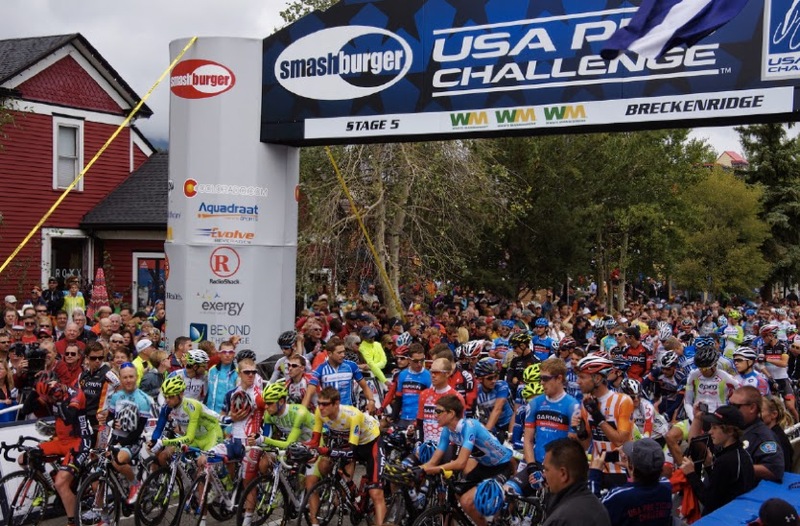 In 2015, the USA Pro Challenge featured 2 stage finishes, 1 stage start, and 1 full day of individual time trial racing in Summit County, Colorado. That is four out of seven stages hosted in Summit County. Why - because Summit County has magnificent cycling. Come discover the RIDE! All photos on this page and on the Ride with GPS Ambassador pages ©by Karen Rakestraw and Laurie Decoteau. Be ready for high altitude riding in the midst of tundra and rocky mountain peaks. 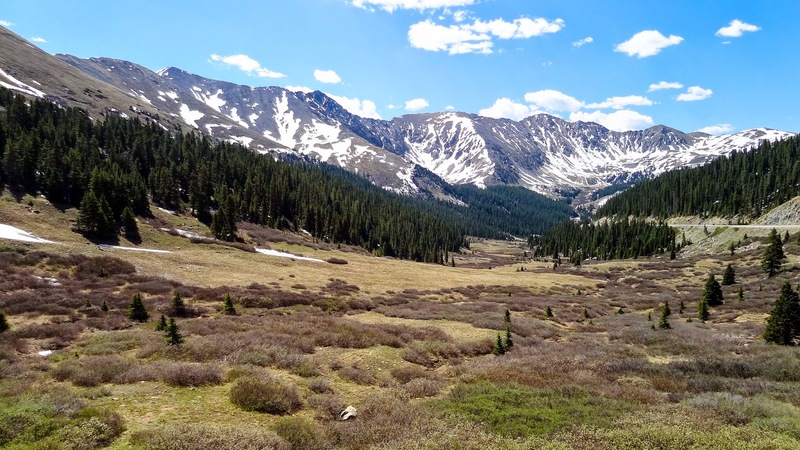 You will enjoy a low-stress accessible scenic bike ride from the quaint mountain town of Frisco, Colorado, to the top of Vail Pass. Vail Pass is a highly recommended road ride in Summit County, Colorado, perfect for solo, group or family rides (with older children). You will join a steady stream of cyclists three seasons of the year on this popular route; not accessible in winter. Round trip distance is 25.8 miles (half of it is downhill!). Some local bike shops (see the list here) offer a tourist shuttle service (with bike rental) to the rest stop at the top (located off of I-70, exit #190). The shuttle vans conveniently unload you and your bike on Vail Pass and set you free to quickly descend all the way back through Copper Mountain Village to Frisco. For much of the way, you will follow a nice paved two-way bike path - free from traffic - with open mountain vistas. Although the route parallels I-70, the large highway is audibly noticeable only at times during the ride. Beautiful in summer and fall, occasional flooding may occur over the bike path (usually passable) in early spring. Watch for late afternoon rain showers (be sure to bring a jacket). Look for mountain goats peering down from rock outcroppings along the path. I like the relaxed vibe at the Frisco Marina, be sure to bike out to the point. The Island Grill (next to the Marina store) has outdoor seating, there is also a lawn for post-ride picnics. Difficulty: Moderate steady climb at altitude. Easy for children if you shuttle to the top and ride down. Your ride starts at the high mountain lake of Lake Dillon in Summit County and ends atop a glorious 11,990ft mountain pass on the Continental Divide. One of my favorite climbs in Colorado, I enjoy the relatively flat warm-up with a gradual climb through pines trees, opening to big mountain vistas and dramatic switchbacks to the summit. You will start at Dillon Marina, cycle the bike path along Lake Dillon and through neighborhoods into Keystone Ski Resort. This is where the real climb begins and sweeping mountain views surround you as you climb to the top. There are sections of on and off 8% as you ascend the final switchbacks. The top of the pass is without facilities but a great place to people watch, take photos and enjoy the view. Pause at the summit to celebrate your achievement with other cyclists who have reached the top from both sides. Join the tourists marveling at the engineering of this road built over the Great Divide in Colorado. Difficulty: Intermediate ride for cyclists who enjoy a steep climb. Due to long descent on road, this is not a ride for children. A nice bike ride with varied terrain sure to entertain your legs with the challenge of short and long climbs and your eyes with scenes of lakes and pine trees. Swan Mountain will satisfy your quest to climb to a view. The road to Montezuma along the Snake River is relatively quiet; a place to get into a rhythm of climbing. This route mixes bike paths with roads. It does not matter exactly how you get through Keystone, just keep going until you find the road to Montezuma (Rd 5, Montezuma Rd.). This is a day to explore and enjoy being in the mountains on your bike. I would recommend riding steady, but taking a break on Swan Mountain and in Beaver Run Village in Keystone. Enjoy a drink at the Marina, or picnic on the lawn, near the boats, upon your return to Frisco Marina. A good ride for all levels of cyclists (allow more time for climbing if needed). Breckenridge is a colorful bustling mountain town known for skiing, mountain biking, and year round special events. Your ride starts near Main Street Breckenridge and heads down valley toward Frisco. The Blue River flows north through the valley toward the lake. 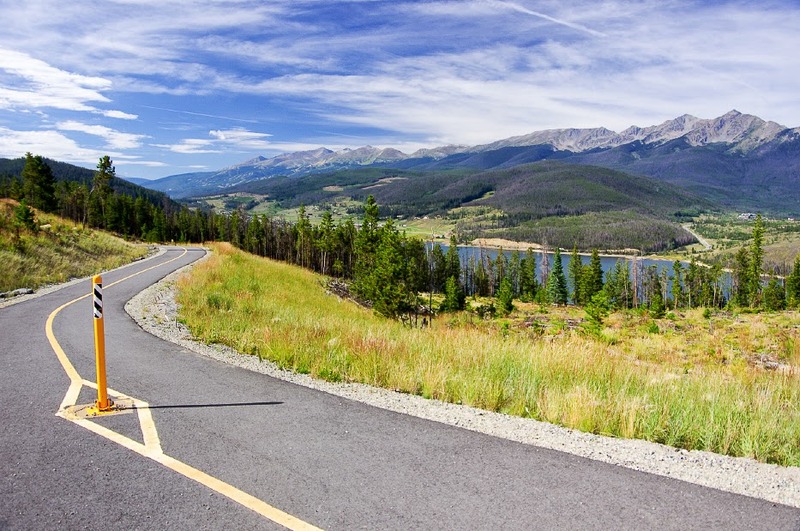 The initial part of your ride will be a smooth downhill ride on the bike path from Breckenridge to Frisco. 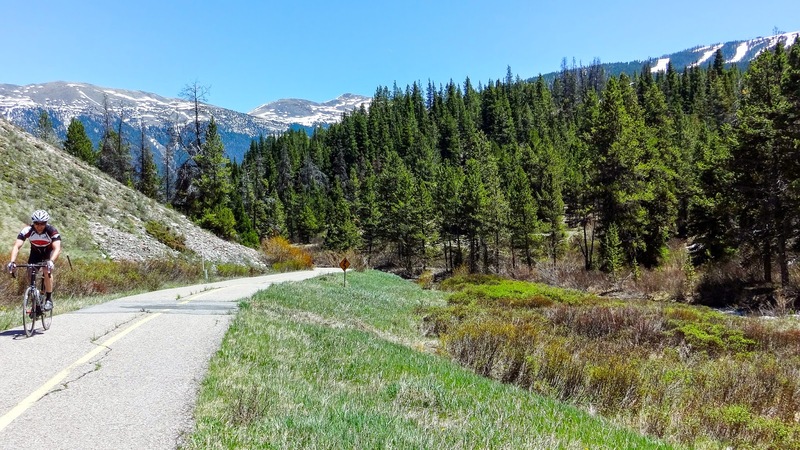 It is possible to loop either way around the lake, but most locals prefer to ride clockwise through Frisco first, Dillon, and then ride the bike path up Swan Mountain (the east side is not as steep as the west side) before returning to Breckenridge. The most important things to know about this route is that the bike path back to Breckenridge is a somewhat uninspiring uphill false flat for 10-miles. 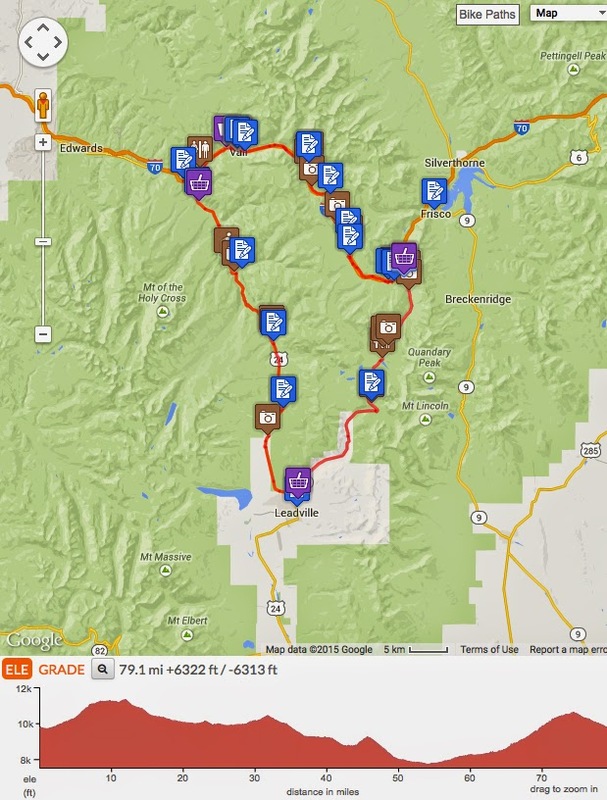 You will notice on the profile map that most of the climbing is tackled on the way back to Breckenridge. You will certainly be happy to reach the numerous bars and restaurants along Main Street upon your return. 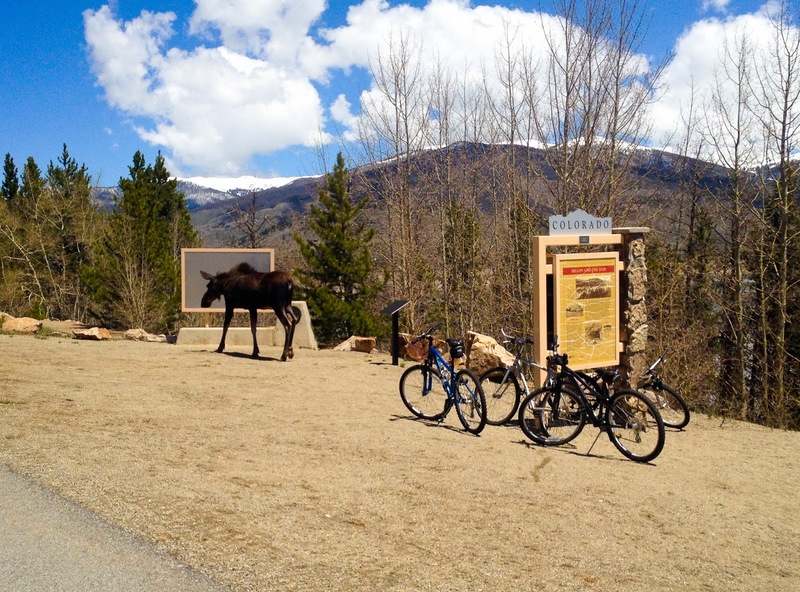 The second thing to be aware of is following the bike path around Lake Dillon takes some attention to route finding, there are a few tricky path connections; keep in mind you will be going clockwise around Lake Dillon, which is due north of Breckenridge. Study the route ahead of time and ask for directions if needed. Difficulty: Intermediate ride for cyclists who enjoy bike paths and great scenery. RIDE: Keystone - Loveland Pass - Keystone - Swan Mountain - Frisco - Vail Pass - Frisco - Swan Mountain - Keystone! Ride two of the best local passes in Summit County in one day. Climb breathtaking (in beauty and oxygen) Loveland Pass and gentle Vail Pass. After this ride, having ridden border to border from east to west, you will feel as if you know Summit County very well. This route offers plenty of choices: you may start in Dillon or Frisco, or reverse the route. 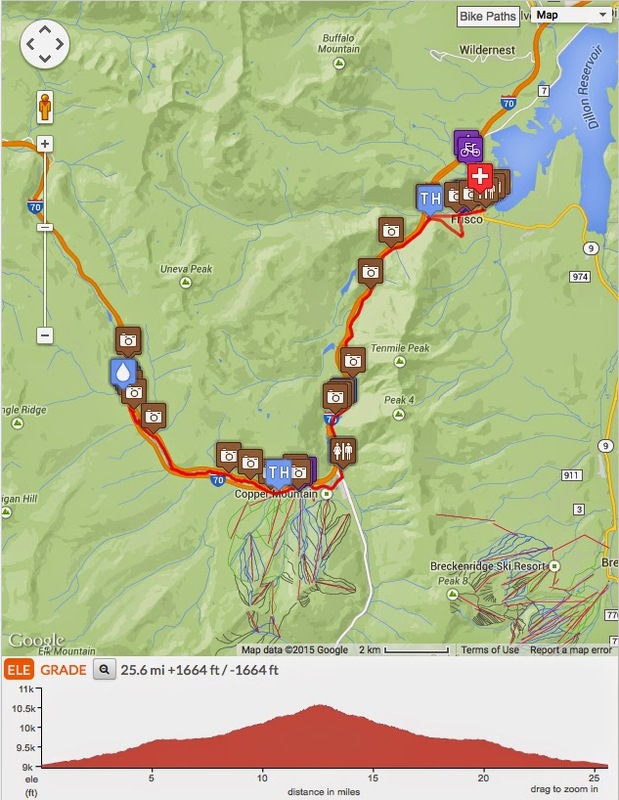 Simply copy the route to your Ride with GPS account and modify the route if needed. Loveland pass has a maximum grade of 9% and is my favorite climb in the area. I like the atmosphere at the top of the pass and the descent off the south side seems to never end. The climb up the gentle bike path to Vail Pass is stress free and often populated, but Vail Pass feels like an accomplishment in its own right. Connecting the two routes takes some time as you wend your way through towns, over Swan Mountain and past Lake Dillon. This is a long morning to mid-day ride, allow enough time and be sure to start early. Enjoy an outside patio after your ride to soak in the high mountain scenery and revel in your accomplishment of two summits in one day. Difficulty: Intermediate-Advanced ride for cyclists who enjoy a steep climbs. Due to long descent on road down Loveland Pass, this is not a ride for children. At a distance of 79-miles, the Copper Triangle is a classic Colorado high mountain loop bike ride. Departing Copper Village and immediately ascending Fremont Pass, you will skirt the city of Leadville, continuing over Tennessee Pass, past Camp Hale, up Battle Mountain through the town of Minturn and enter Vail Village. You only have the steep climb up Vail Pass ahead of you before an easy descent returning into Copper Village to complete the loop. This route is recommended for advanced-intermediate to advanced cyclists: long climbs, exposure to the mountain elements, cycling at altitude. The Copper Triangle is a long tradition for Colorado cyclists and a definite bucket-list ride. It is the route used annually for the Colorado Cyclist Copper Triangle event ride to benefit the Davis Phinney Foundation for Parkinson’s disease. Held the first week of August, the ride typically sells out in capacity. The special event is relatively expensive but does donate to charity and provides a great expo, lunch and live music afterwards in Copper Village for all participants. Although beautiful on any quiet weekend, this route is lots of fun with hundreds of other cyclists peppered along the climbs. Difficulty: Intermediate to Advanced cycling at altitude over semi-isolated mountain passes. Long route, come prepared. Summit County is located in central Colorado, a 1.5 hour drive west of Denver, surrounding the beautiful high mountain lake of Lake Dillon. Several "Fourteeners" (14,000 foot mountain peaks) frame the area with 4 ski resorts located inside county borders. The towns of Frisco, Dillon, Breckenridge, Keystone, Montezuma, Silverthorne, and Copper Mountain are popular destinations year round. Road cycling in the area is spectacular and varied, with miles of bike paths or well maintained roads. Summit County, Colorado is well worth a weekend or week long vacation full of adventure. Local weather: Winter snow, Spring mud, Summer showers, Fall glory. Summit County has four seasons displayed in full color across its mountain peaks, rushing rivers, afternoon rain showers and changing leaves. Be smart and plan your bike rides in Summit County between 8:00am and 1:00pm. Mornings will be cool, mid-day will be warm to hot, afternoon (2:00-4:30pm) will likely be rain, which should then clear to make for a nice evening. If rain begins to fall or lightening begins to strike, find shelter and wait it out. Lightening is common on high peaks; the rule in Colorado is off the summit by 1:00pm. Sunscreen: High altitude sunburn is real. Apply sunscreen before you depart on your ride and again during or after your ride. Local wildlife: From your saddle you might see waterfowl, eagles, mountain goats, moose, and bear. And only if you ride really really slow - fish. Your bike: Check your tires before departure: for road bikes 100psi is good. Your road bike gearing should be at minimum a compact crank with 26, preferably a 28 or 32 rear cog. All of Summit County is at altitude - Lake Dillon is 9,017 feet (2,748 m). What to bring with you on your ride: Two full water bottles, extra food, rain jacket, layered clothing, extra inner tubes with air cartridge or pump, camera, cell phone with Ride with GPS! What to bring in your car: Floor pump, extra dry clothes to change into immediately after the ride, extra sunscreen, fresh water and a wash cloth, snack and water (replacement drink or smoothie) for your drive home. Water fountains: Drinking fountains and spigots are usually only turned on in public places in Colorado between Memorial Day (May) and Labor Day (September). Your best bet for water in the shoulder seasons is to purchase bottled water at gas stations. Food and drink after your ride: Local restaurant recommendations are made under each ride Description. Bring bars, gels or food with you on your ride. Parking, water and restrooms on route: Local recommendations are made under each ride Description. Colorado cyclists generally plan on 1 bottle every 45 minutes of cycling. Points of interest along the ride: Local recommendations for tourism and viewpoints are made under each ride Description. Cycling the high passes: It can get very cold on the passes. The summit of Loveland Pass can be much colder than the temperature in town. The descent off of Loveland Pass to Keystone is long, if you are already cold at the summit, you risk hypothermia by the time you reach the bottom. Please bring a jacket with you while riding (even in summer months) in Summit County and especially to Vail Pass or Loveland Pass. How to deal with altitude: All of Summit County is above 9,000ft. Go steady and hydrate, it is advised to drink 2 to 3 times more water than usual at high altitude. Avoid alcohol (at least for the first day). Choose your easiest activities for your first day until you begin to acclimate. You will feel the altitude in your lungs while pedaling. Altitude headaches and loss of sleep are common and Tylenol may help. 20-30% of visitors feel this affects. If ill, go down in altitude; seek medical attention for vomiting and severe sickness. What happened to the trees? : Over the past decade, Summit County was hit by a mountain pine beetle epidemic, suffering a major loss of trees on private and public lands. The beetles moved on by 2009 and most of the dead trees have now been removed leaving wide-open vistas. You will notice very visible deforestation around Lake Dillon. Ski Resorts and sports: There are 4 ski resorts within the county: Keystone, Breckenridge, and Copper Mountain continuously add new runs and vie for title of largest. Without a doubt, Arapahoe Basin (A-Basin) is the smallest. Boating, fishing, hiking, nordic skiing, snowshoeing, snowmobiling, ice skating, golfing, mountain biking and climbing the nearby 14,000ft mountain peaks are all very popular local sports. Free countywide transportation: The Summit Stage bus runs between the towns in Summit County - hop on for free! You can put your bike on the front of the bus; something to keep in mind if you only want to ride one-way. See the Summer Bus Schedule (mid-April to mid-November), or Route Maps. The bike paths in Summit County are not plowed in winter. The path from Frisco to Copper Mountain is not opened until avalanche danger is low. Snow may remain on sections of the path (locally called the "rec path") until late spring depending on weather. Local bike shops can inform you of bike path conditions. Article: Bike Rec Path undergoing 2015 Spring maintenance. 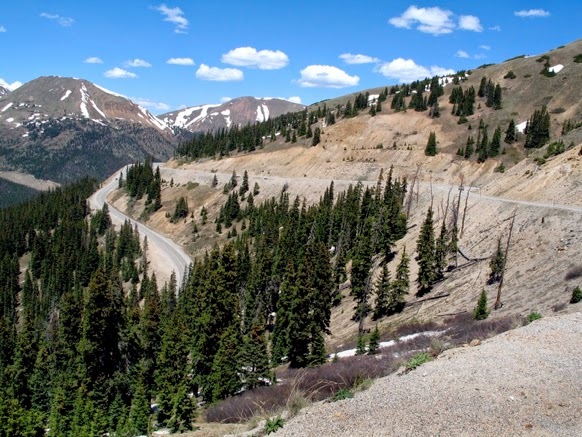 For more details about the climbs in Summit County, please visit the Pedal Dancer Guide Page COLORADO CLIMBS, where you will find climb stats and links to ride reports from Colorado experts. You have a few opportunities to ride your bike over the Continental Divide while cycling in Summit County - specifically you will be riding over the Great Divide (thus the name of the Colorado brewery). The Vasquez-Gore Segment of the Continental Divides runs through Silverthorne and Copper Mountain. Portions of the divide are in the Vasquez Peak, Ptarmigan Peak, and Eagles Nest Wilderness Areas. 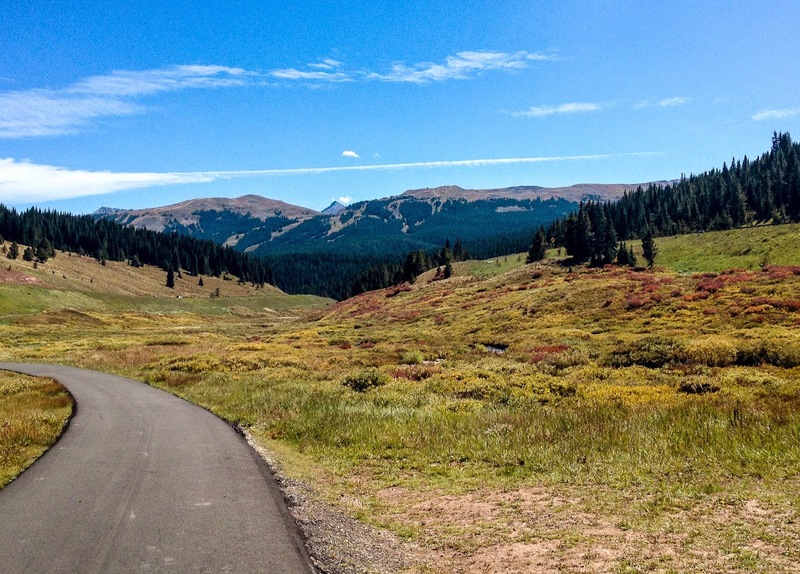 Road or mountain bike climbs that cross the divide in Summit County are Loveland Pass, Boreas Pass, Hoosier Pass, Fremont Pass and Tennessee Pass. Some bike shops now rent fat bikes. These wide tired bikes can be ridden over snow trails - it takes a bit of effort, but is great fun. Visit Gold Run Nordic Center, (200 Clubhouse Dr, Breckenridge, CO 80424), located between Frisco and Breckenridge, for Surly Pugsley fat bike rentals. June 21-27, 2015 - Bicycle Tour of Colorado (week-long tour) starts and finishes in Breckenridge in 2015. 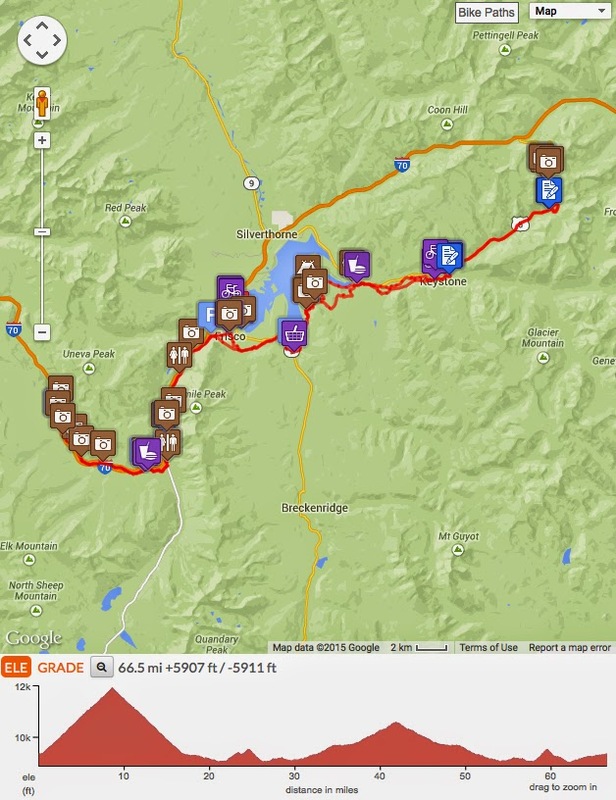 See the 100.8 mile Circle the Summit route on Ride With GPS. Loveland Pass: There is a wide shoulder for cyclists, big mountain road, at altitude, max grade of 9% with several sections of 8%. There are no services at the summit, and a long descent on the main road. Keystone: You will be riding on neighborhood roads on bike path through the resort and past a golf course and small man-made lake. Swan Mountain: Less steep on the east side where you will follow a designated bike path to the top. Much more steep on the west side where you will be climbing on the road. Frisco: A quaint Main St with lots of restaurants and services - an excellent place to take a break. You will be riding along Main St and on bike paths. 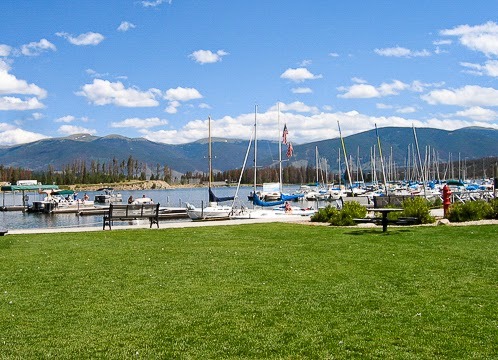 Lake Dillon: Just off of I-70, you might first notice gas stations, outlet stores, large chain stores and hotels, but venture over to the Frisco Marina where locals gather at restaurants and free concerts in the Dillon Amphitheater. Breckenridge: A bustling tourist town year-round, Breckenridge has a charming Main St packed with shops and people. The surrounding mountains are breathtaking in winter and summer. You will find lots to do in this mountain town with plenty of special events and outdoor recreation. Copper Mountain: The two-way bike path between Frisco and Copper Mountain, and Copper Mountain and Vail Pass, is well maintained and graded. Just keep going straight. Copper Village is a seasonal ski village; some businesses may be open in the village in summer. Vail Pass: The top will feel like the top of one giant grassy hill. For a nice view continue past the rest stop at the top to the lake on the other side. Vail Pass has full services at the summit. Summit County is an ideal place to visit for a weekend or for a longer vacation of 3 to 7 days. You will find plenty to keep you busy, or relaxed. Accommodations: The nicest (and busiest) locations to find accommodations for a vacation are in either Frisco or Breckenridge, where you will find hotels, lodges, B&Bs, condos and homes for rent. In Silverthorne and Dillon you will find large chain-hotels that service the I-70 corridor. Copper Mountain Village and Keystone Village are very active ski destinations in wintertime but quiet in summer; condo or home rentals are a better option in these two villages. Camping: There are three campgrounds surrounding Lake Dillon, but most of the trees died off (beetles) between 2004 and 2009 leaving the campsites quite open and exposed. Also road noise from I-70 can be heard at certain campgrounds. Ute Indians settled in Frisco long before the first white man - called "mountain men" - arrived in 1810. By the 1880's, mines, railways, saloons and hotels populated the area. The relative boom continued until the Great Depression, when the population fell to just 18 individuals. A ski boom hit Vail and nearby Summit County in the 1970's. Today more than 3 million tourists Visit Summit County to ski every year. The town of Dillon was formed when the gold mining boom hit the region and local residents gathered near the convenience of a cluster of small lakes fed by the Blue River. In 1961 Lake Dillon Dam was built and the natural lakes merged into one much larger man-made reservoir for the purpose of supplying water to the growing city of Denver. The original town of Dillon was flooded over. 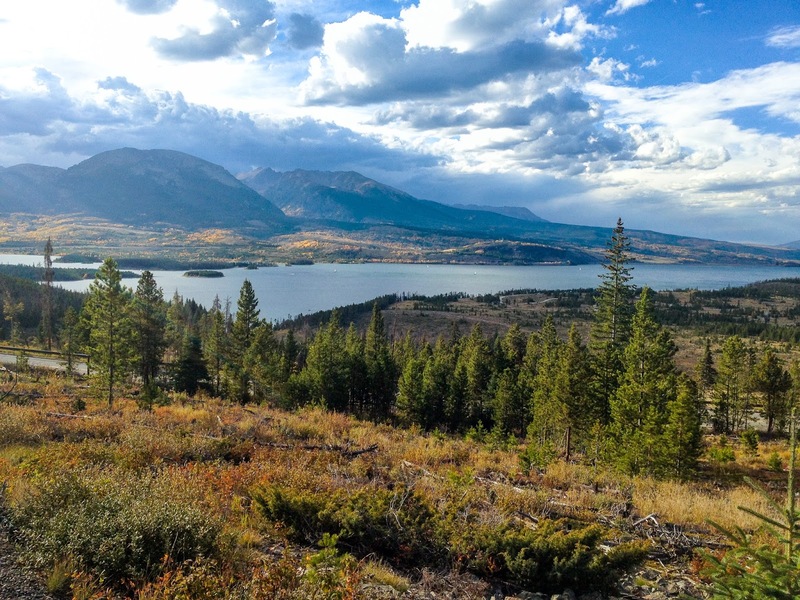 The large body of water is still referred to as a lake - Lake Dillon. Today, drought years are particularly noticeable around its banks. Hwy 6 over Loveland Pass was the only passage over this section of the Rocky Mountains until the Eisenhower Tunnel was built and opened in 1973. Today, trucks carrying dangerous fuels are not allowed to enter the tunnel, they must instead continue over the old Hwy 6 through Keystone to rejoin I-70 in Dillon. Although most cars now use the tunnel, you will feel the push of air as these large tankers (generally considerate and aware of cyclists) pass you during your climb. 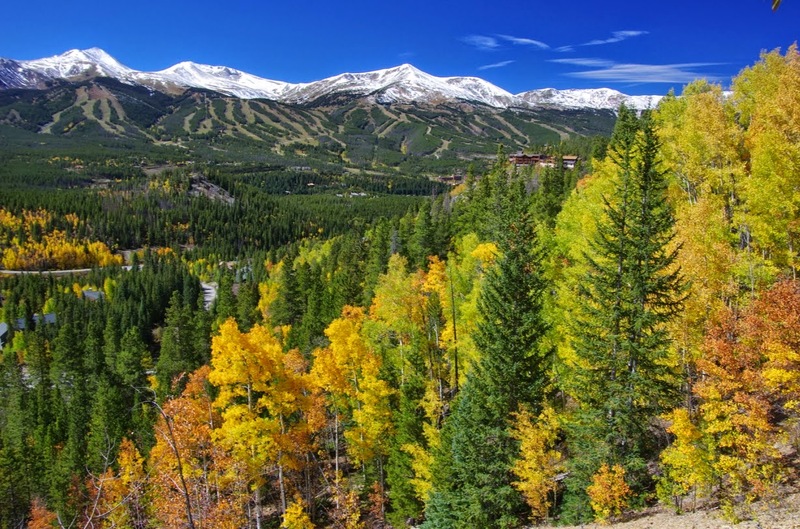 Breckenridge has more character and breathtaking beauty than any other town in Summit County, mostly due to it's charming Main St architecture (the largest historical district in Colorado) and the surrounding snow-capped mountain peaks (which are numbered 6 - 10). Gold was discovered along the Blue River in 1859, the entire river basin has been reformed from massive mining. The Gold Pan Saloon was built in 1859 and is still in operation today at 103 N. Main Street. Keystone Ski Resort was founded on November 21, 1970 by champion skier, former forestry professor and visionary, Max Dercum (who also opened A-Basin). Spread over three mountains and known for it's gondola fondue dinners and night skiing in winter, it also offers lift to downhill biking in summer. The village is a pretty stone and floral basket setting and a nice place to take a break while riding. Did you know the area of Copper Mountain was once called Wheeler Junction? Judge John S. Wheeler established a settlement at the junction between the Ten Mile and Gore mountain ranges in 1880 when mining, fishing and hunting were prevalent. Now a very popular ski destination, known for separating it beginner to advanced terrain, several 10th Mountain Division Huts have been built nearby in the back country. Vail Pass is only 5-miles away by bicycle. The modern Interstate I-70 was completed in 1992. The large highway climbs over Vail pass (with steep 7-8% sections) hosting 2 runaway truck ramps to prove its steepness. At one point engineers had considered tunneling through the Eagle's Nest Wilderness area, which would have greatly changed the landscape of what we have come to know as Vail Pass. I-70 replaced the old Hwy 6, which remains intact in parts and is now used by cyclists free of traffic. Vail, Colorado is known for it's world class skiing; regularly playing host to both professional ski races and happy ski tourists. Vail also has excellent high altitude road cycling and mountain biking. Incorporated as a city in 1966, Vail is small in size, squeezing 5400 of its population into only 4.5 square mi (11.7 km2). Tourists swarm the place during the winter ski season and again during the season of changing fall foliage. The town of Vail can either seem very busy or nearly abandoned. In the Early 1960's, Pete Seibert (former WWII 10th Mountain Division ski trooper) founded Vail Associates, which became the now publicly traded Vail Resorts. The company operates the ski resorts of Vail, Beaver Creek, Breckenridge, and Keystone. It also operate many hotels and lodges in the area, as well as ski resorts in CA, UT, MN, MI, and WY. The company employes 4,700 year-round employees and 17,900 seasonal employees. Convenience Store located near Frisco High School (to the left after you descend Swan Mountain). Broken Compass Brewing Beer (just off the bike path back to Breckenridge) Location: 68 Continental Ct, Breckenridge, CO 80424. Soupz On, Soup, breads, salads and sandwiches. Mon - Sat 11:00am-6:00pm. Location: 400 North Park Avenue, Unit b-2, Breckenridge, CO.
Local Market, Groceries and Liquor. Location: 116 North Main Street, Breckenridge, CO 80424. Giampietro Pasta & Pizza, Good pasta and pizza in this very small restaurant, also has take-out. Open daily 11:30am- 9:30pm. Location: 100 N. Main St. # 212, Breckenridge, CO 80424. Downstairs at Eric's, Good for big parties, families and kids, quite dark downstairs but popular. Location: 111 South Main Street, Breckenridge, CO 80424. Starbucks, As usual coffee, pastries and sandwiches. Location: 225 S Main St, Breckenridge, CO 80424. Crepes a la Cart, Crepes to go, outside seating only. Located in a small trailer, very popular for quick snacks all day long. Location: 307 South Main Street, Breckenridge, CO 80424. Empire Burger, Burgers! Open daily 11:00am - 1:00pm. Location: La Cima Mall, 500 S Main St, Breckenridge, CO 80424. Blue Moose Cafe, Standard breakfast and lunch. Open daily 7:00am - 1:00pm. Location: 540 S Main St, Breckenridge, CO 80424. Breckenridge Brewery, Beer and basic brewery food. Open daily 11:00am-11:00pm. Location: 600 South Main Street, Breckenridge, CO 80424. Butterhorn Bakery: Good breakfast and lunch, plus pastries and breakfast burritos to go. Open 7:30am-2:30pm (no dinner). Location: 408 Main Street, Frisco, CO 80443. Prost Fine Beers and Sausages: Beer, sausages, soups and sandwiches. Open daily 11:30am-10:00pm. Happy Hour daily 4-6pm. Location: 313 Main St, Frisco, CO 80443. Island Grill and Bar: Food and drink on patio restaurant in Marina. Nice patio. Open Memorial Day to Labor Day. Open daily 11:30am-7:00pm. Happy Hour daily 4-7pm. Free Live music on Friday nights during Happy Hour. Location: 900 E Main St, Frisco CO 80443. Food Hedz: Very nice lunches and dinners, changing menu of fresh food. Best for sit down meals with wine. Location: 842 Summit Blvd, Frisco, CO 80443. closed Sundays and Mondays, open Tue-Sat: 11:am-3pm and 5-8pm. Arapahoe Cafe: Food and drink on the patio. Serves breakfast, lunch and dinner. Open daily at 7am (except closed between 2-5pm). Location: 626 Lake Dillon Ave., Dillon, CO 80435. Tiki Bar: Locals favorite for drinks and basic food. Open M-F 2:00pm, Sat & Sun open at 11:30am, Happy Hour daily 3-6pm. Location: 150 Marina Dr., Dillon, CO 80435. Numerous additional cafes and restaurants may be found in the seasonal village of Keystone; some with nice patios, fountains or flower baskets. The Pour House: Coffee, bagels, panini, sandwiches, breakfast burritos, full bar. Location: 40 Cove Blvd, Dillon, CO 80435 (Summit Cove). Open daily 6:30am-7:00pm. Incline Bar and Grill: Serves a varied American menu and bar; outside seating. Location: 178 Copper Cir, Frisco, CO 80443, Open daily 11:am-10:00pm, Happy Hour daily 3-6pm. Camp Hale Coffee Shop: Coffee, fresh pastries made onsite, breakfast and lunch snacks. Open daily 7:00am-12:00pm only. Location: 184 Copper Cir, Frisco, CO 80443. Casa Sanchez: Family owned Mexican food and margaritas. Location - Located at Village Square Condo at the Boardwalk. Copper Mountain Village: some restaurants or coffee shops might be open in Summer (this village is somewhat seasonal). Quiznos and Conoco: at the end of the bike path from Frisco, just before (east) of Copper Mountain Village is a cluster of buildings where you may find water and food and public restrooms. This is an excellent place to wait out afternoon rainstorms (which typically last 30-50 minutes). Location: near I-70, Exit 195. Yeti's Grind: Coffee shop, some snacks. Sponsor a cycling team! 141 East Meadow Drive #108, Vail, CO 81657. Terra Bistro: Fine cuisine - 100% natural organic ingredients, Open 7:30am-10:00pm. 352 E Meadow Dr, Vail, CO 81657. Big Bear Bistro: Quick, not too expensive, coffee, burritos, crepes, sandwiches, drinks. Open daily 8:00am-7:00pm (5pm on Sundays). 297 Hanson Ranch Rd, Top of Bridge Street, Vail, CO 81657. Vendetta's: Italian food. Open from 11am - 2am, 7 days a week. 291 Bridge Street, Vail, CO 81658. Loaded Joe: Coffee Shop by day, musci entertainment by night; 227 Bridge St, Vail, CO 81657. Sweet Basil: Lunch 11:30am-2:00pm / and Dinner 5:00pm-10:00pm daily; 193 Gore Creek Dr, Ste 201, Vail, CO 81657. Breckenridge has an active Main St filled with shops; it is a great place to stroll. 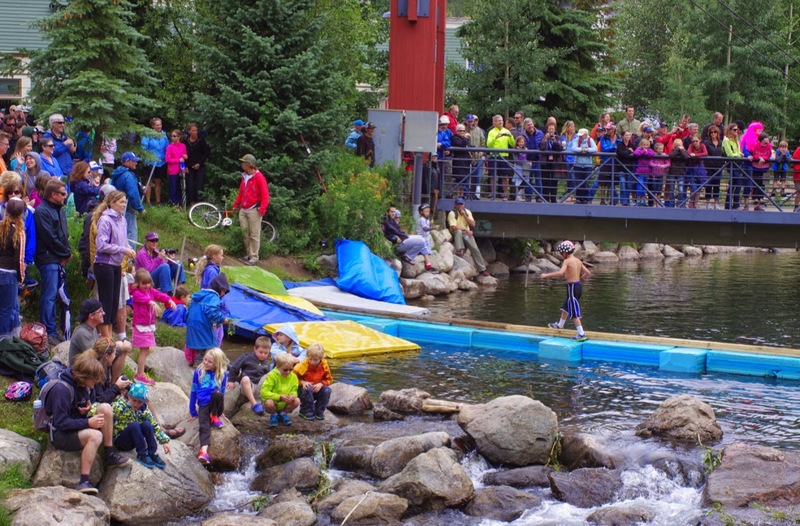 Breckenridge is also known for its year round special events. Breckenridge has a kids (small and big) Summer Fun Park on Peak 8, located up Ski Hill Rd. Ride the super slide, zip line or go for a guided hike. The Colorado Trail is nearby offering great mountain biking in Breckenridge. See the great website of rides at the MTBProject. The nearby dirt road up Boreas Pass is a nice drive and spectacular in fall when the aspen leaves change color. You can hike a fourteener while in the area - 14,265 foot Quandary Peak is only 6-miles southwest of town. Keystone: with a population of just over 1,000, Keystone ski area offers nearly 3 acres of skiing per full-time resident. 20 ski lifts and 2 gondolas service a mountain with 57% terrain rated as "most difficult." Keystone Village is a man-made mountain base collection of condos, shops, homes and a golf course. Keystone has year-round special events. Keystone Bike Park: features miles of single-track trails. You may ride the lift up and cruise the single track down. Bike rentals, helmets and safety equipment are available at the base of the lift in the village. Bike Park information. Attend a bike clinic in summer. Arapahoe Ski Basin: Nicknamed A-Basin, hosted a stage finish of the 2015 USA Pro Challenge. Probably the least well known of the local ski resorts, A-Basin boasts the highest in-bounds skiable terrain (960 acres (3.9 km2)) in North America. Established in the 1940s, its relatively small 8-chair resort often stays open as late as July. Loveland Pass Summit Sign: The sign at the top of Loveland Pass marks an 11,990foot point on the Continental Divide. The views are worth the journey and this is a fun place for a photo-op. Look for moose as you ride around the lake. Lake Dillon Marina: On the north shore of Lake Dillon, the marina features a fully stocked store, some boat rentals and sailing lessons. Watch the weekend regattas. Lake Dillon Free Concerts: Sunset at the Summit, a free Saturday evening series of live concerts takes place at the outdoor Dillon Amphitheater from July 4 to September 5, 2015. Swan Mountain is a short cut between Frisco/Breckenridge and Keystone. It is a nice climb for cyclists and a new bike path was recently built on the east side. Frisco Marina has rental boats and scenic activity. 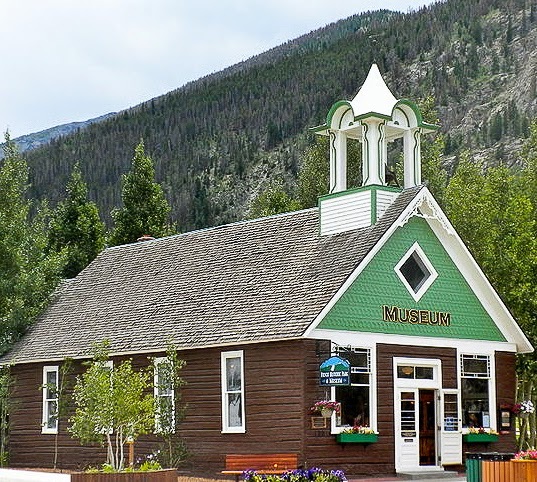 Frisco has a small museum, historic park and frequent festive outdoor town events. Copper Mountain Village is also a lovely setting for outdoor events. Copper Village has a kids play area featuring Go-Karts, climbing wall and mini-golf. Vail Pass is a large rest stop off of the Interstate (I-70). The descent back into Copper Mountain is quick and easy. Vail Village is geographically split by the large Interstate-70. Much of the architecture has now been modernized from its 1970s ski village appearance to a posh resort with high-end restaurants and fancy hotels. It is a lovely stroll through the main village (located on the south side of the highway). The delightfully peaceful Betty Ford Alpine Garden is located in Vail (another stop your sag support driver might enjoy). Gardens Website. You will ride traffic free up to Vail Pass on the old Highway 6. You might notice names on the road from bygone bike races. The USA Pro Challenge has used this road twice for individual time trial stages. The road is a false flat, far more challenging than it appears to the eye. The hiking area of Mayflower Gulch - near Fremont Pass - has spectacular wild flowers in spring and summer. Climax Mine is a major molybdenum mine (don't drink the water!) that has marred the land but at one point employed over 65,000 people (most did not last long). The old homes from Climax were long ago moved to nearby Leadville. The town of Leadville is largely unattractive but famously hosts the Leadville 100 mountain bike race annually. You will be crossing over The Continental Divide (specifically the Great Divide: Tennessee Pass is located on the Continental Divide. 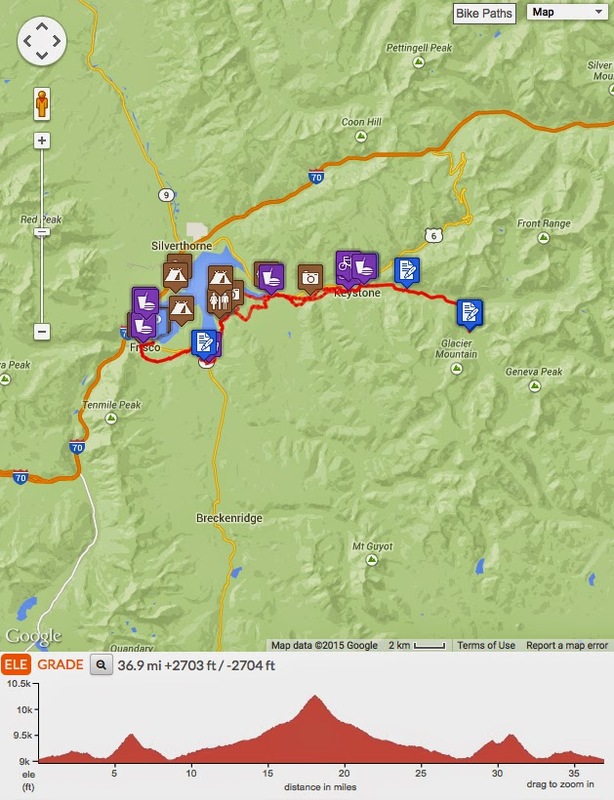 See an interactive Map of Continental Divide National Scenic Trail. 10th Mountain Division troops trained in the area on their large military base during WWII where they perfected winter mountaineering combat skills. Several 10th Mountain Division huts dot the area and are a thrilling activity in winter, they also offer good single track riding for mountain bikers in summer. Minturn is a town with far more character and offers restaurants, cafes, shops, B&Bs, and even a saloon. A good place to pick up a snack that you will barely have time to digest before the very steep final climb up Vail Pass. For all bike rentals, please call the shop to ask about frame size, gearing, and availability. Reserve your bike well ahead of time. The majority of bikes are hybrid family bikes, some mountain bikes are available for rent, with limited high quality road bikes. Some stores have multiple locations. Shuttle Services are a tourist activity; shuttling riders by van to the top of Vail Pass allowing cyclists a nice easy bike path descent back to Frisco. 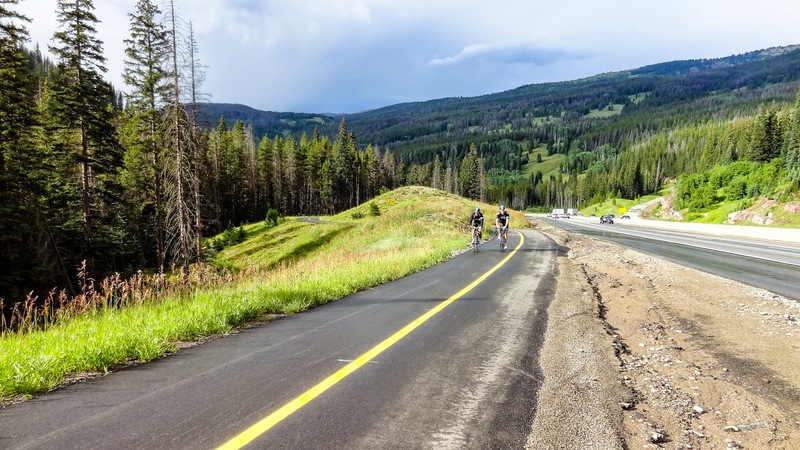 Note that the bike path from Frisco to Breckenridge is a false flat and may be difficult for young riders, if you plan to take your family to Vail Pass it might be best to complete your ride in Frisco. Mountain Wave Ski & Snowboard - 600 S. Park Ave. Breckenridge CO 80424, 970-368-9439 * bike rentals * Trek Road Bikes * shuttle services to Vail Pass. Mountain View Sports - 22869 US Highway 6, Suite 108 Keystone CO 80435, 970-468-0396 * bike rentals * shuttle services to Vail Pass. "Ride as much or as little, or as long or as short as you feel. But ride" ~ Eddy Merckx. I also cover and write fan guides to the USA PRO CHALLENGE annually. Now cancelled!